Edit and customize special multi track backing tracks, remove instruments or vocals you want to play or sing yourself, and once you've got the perfect backing track, save the end product as a .wav file to sing or play along to yourself! Multi Tracker software is so easy to use and it's also FREE! More information below..
Extracts tracks as .AIFF or .WAV files to load into GarageBand, Logic etc. 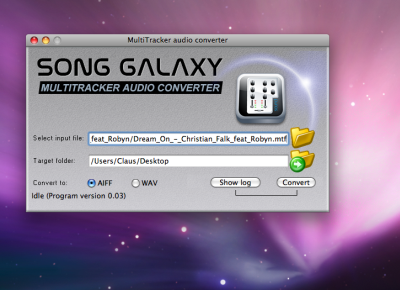 Instructions: Please download the MTF (Multi Track File) and unzip the file, then load into Multi Tracker. Over the years Audio Midi Mania has received numerous requests from customers, asking if we could produce certain tracks without a certain instrument (eg. minus guitar or drums), as they want to play this instrument themselves. And we also know that each one of our valued customers has different preferences when purchasing backing tracks. 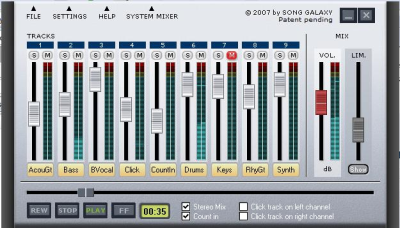 However, up until now, the only Multi Track software available has been for recording multi track files. Therefore, Audio Midi Mania is proud to introduce our revolutionary Multi Tracker software. Multi Tracker is a flexible, do-it-your-own-way program which separates special multi track files (*.mtf format, available here) into up to 16 individual tracks with each instrument or instrument group on a separate track. This gives you the freedom to adjust exact levels of individual tracks, or mute instruments you want to play yourself. A free video tutorial for Multi Tracker is available at our Home page. The latest version of Multi Tracker for Windows also allows you to save each individual track as a separate .wav file, which can then be exported and loaded into a DAW audio sequencer of your choice (eg. Cubase, Sonar, Pro Tools...) to be edited further! Please note: Due to the nature of this format, Multi Track files are fairly large. File sizes are indicated in our catalogue. We recommend using broadband to download, or selecting Delivery on CD. * A Click Track if your band uses a live drummer. You have the option to create a mono mix of the instruments on one side and the click track on the other as is usual for this type of mix. * If you want to play drums yourself, you can mute the 'Drum' track and leave the rest of the song as it is to play along with. * Or if your band doesn't have all the instruments for a certain song, you can simply mute the instruments you do have out of the .mtf file, leaving the ones you're missing, for you to play along with. * Band practice - if you want some extra practice on your own, but still want the sound of the rest of the band, just download the Multi Track and select the instruments you need. * What if one of your musicians falls sick just before an important show? Just buy the Multi Track from our catalogue and customize it using Multi Tracker to play that one track that you're missing.. It's so easy and fast, you'll still have time to write your musician a Get Well card! As our Multi Track files are a new product for Audio Midi Mania, our catalogue is still fairly small, but we will be adding to it regularly, so come back often to see our new songs! Update January 2010: Our Multi Track catalogue is now over 2000 songs... and counting! We have now added some tracks to our Multi Track catalogue which can be requested by entering your e-mail address. When the song becomes available, you will be informed by e-mail straight away! These requestable songs will usually be available within 2-3 days of your request. There are so many possibilities and the program is so easy to use, what can you do with Multi Tracker? Send us your feedback to office@audiomidimania.com - What did you think of Multi Tracker? What have you used it for? Any ideas for improvement? Let us know!